Tickets are now on sale for the Wilmette Historical Museum’s Spring Housewalk with advance ticket prices beginning at $40. This year's housewalk will be held on Sunday, May 19th from 1:00-5:00 p.m. and features four beautiful historic homes in east Wilmette. Ticket-holders will tour inside the 1890s home that once belonged to the Gillson family, after whom Gillson Park is named, a Mid-Century Modern house designed by an architect for his own family, a lovingly restored Tudor Revival residence, and a Colonial Revival masterpiece. Housewalk highlights include Mid-Century Modern furnishings, a stunning contemporary art collection, lovely original woodwork and antiques, Arts & Crafts decorative details, and intriguing stories about the families that have lived in these homes. Click here for more details and to buy your tickets. The Museum and the Police Department will be holding annual Open Houses, just one block apart, on Sunday, May 5th from 11:00 a.m. to 2:00 p.m. Visitors are invited to step inside the Museum's historic 1896 building for self-guided tours, a family-friendly game of “Museum Bingo,” and a free cookie. Popular exhibits will be open, including an original Gross Point Village Hall jail cell. You won’t want to miss seeing our two temporary exhibits -- "Beer Wars" in our Main Gallery and "All that Glitters" on our Lower Level. 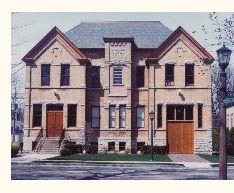 Outside on the Museum lawn, the Wilmette Community Band will be playing from 12:00 to 1:00 p.m. Be sure to stop by the Police Station as well! We hope to see you at this free event for the entire community. Closed for holidays: 4/21, 5/12, 5/27 and 6/16.